Hand painted lanternslide depicting a dentist's office, inside a handmade wood frame. 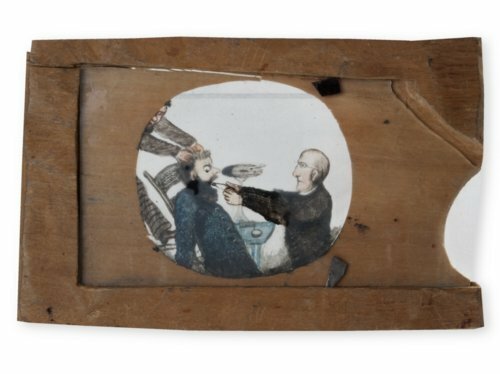 Slide depicts a man having a tooth pulled by a dentist. The slide can be manipulated so the dentist appears to yank the tooth with a forceps. Part of a collection made by Samuel Reader between 1866 and 1913. Reader was a Kansas farmer who was active in the early Topeka community. He built two homes, served in the Civil War, and wrote in a diary nearly every day for 64 years. Reader began painting slides in 1866 and continued throughout much of his life, holding magic lantern shows for the local community in his house and at church. dentist appears to yank the tooth with a forceps. Part of a collection made by Samuel Reader between 1866 and 1913. Reader was a Kansas farmer who was active in the early Topeka community. He built two homes, served in the Civil War, and wrote in a diary nearly every day for 64 years. Reader began painting slides in 1866 and continued throughout much of his life, holding magic lantern shows for the local community in his house and at church.